One of the most quotable lines in the movie, “ Leave the gun, take the cannolis,” was ad-libbed by actor Richard Castellano. Paramount Pictures pushed Puzo to write the original screenplay as a modern story “set in the 1970s, complete with hippies.” When Coppola came on board he dismissed it as “a slick, contemporary gangster picture of no importance. It wasn’t Puzo’s fault. 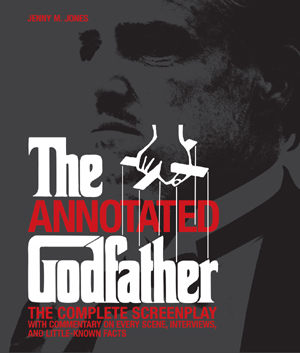 He just did what they told him to do.” It took Coppola and Puzo two more drafts to arrive at the final script, which Jones’ reproduces in full, with notes by Puzo and Coppola scrawled in the margins.